The internet revolutionized how people find information, communicate with each other and make purchases. And then a few years ago, content management systems revolutionized the internet. Today admins with little technical expertise are managing and updating large websites with multi-level functionalities. We have highly scalable, yet agile, content management solutions that deliver exceptional online experiences and allow multi-level collaborative content creation. Their growth and acceptance have been so extraordinary that more than 60% of all websites today run on some form of content management system. There are hundreds of CMS options available in the market right now. These can be used to build everything from simple blogs to expansive enterprise-level ecosystems. 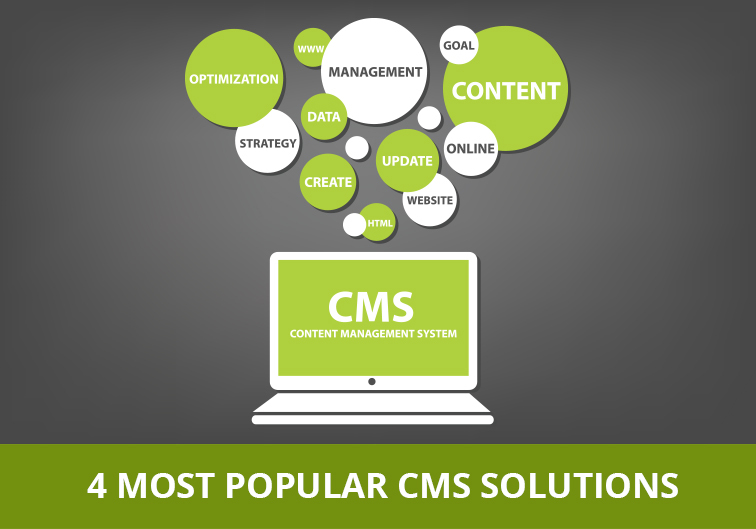 Each CMS platform has own strengths and weaknesses, and is ideal for certain application types. Though it began as a simple blogging platform, WordPress has grown to become the most widely used CMS solution in the world. Today, nearly 40% of all CMS-based websites run on WordPress. These include heavyweights like Bloomberg, Forbes, Conde Nast, and the Walt Disney Company. This easy-to-use platform is supported by an ever-expanding list of plugins and themes that promise exceptional expandability and optimisation. Want to get ahead of the competition with a personalised WordPress website? Get in touch with us today. One of the easiest to use platforms, with a simple yet feature-filled user interface. Stability decreases as more plugins and extensions are added. So, access to a technical team would be helpful. Very little technical expertise required for core set up. A highly versatile open-source CMS platform that packs tons of features and functionalities, Joomla offers the perfect balance between ease-of-use and complex development capabilities. It boasts of a very passionate and active community of users. The platform is used by some of the biggest global brands and government agencies in the world. To learn about the many ways that a personalised Joomla website can help you build your brand, talk to us today. Core features are available free of cost. But extensions and templates are chargeable. Mid-level technical expertise required. Designed for both beginner and advanced users. Sitecore is an enterprise-level content management system built on .NET. The CMS was built with a focus on marketers and provides an extensive suite of digital marketing features. Sitecore is used by leading global brands like Nestlé, American Express, Canon, Toshiba and more. The CMS is supported by powerful APIs, a strong developer framework and extensive databases to deliver customizable and extensive enterprise-class solutions. Discover how a sitecore website can turbocharge your business. Get in touch with us. Easy to use, with a customizable desktop interface. Perpetual or subscription licenses can be purchased starting from $8,000. Pricing depends on the number of installations, users and add-on modules. Relatively stable and secure. But regular update and maintenance required. Expertise in digital analytics and marketing needed to effectively use the feature-filled back-end. o Fast and flexible. Powerful and extendable. Drupal is one of the most powerful content managements solutions in the market today. An open source platform, it is also one of the most stable and secure options available. The platform is highly versatile and offers remarkable customization. Its open source infrastructure does require a degree of technical expertise, but it also allows unparalleled scalability, personalization and reliability. In fact, effectively implemented, it can deliver better user experience and easier client-side management than most other platforms. Build the most optimised Drupal-based digital presence for your business needs. Get in touch. A bit more complicated than other CMS platforms. Open source and free to use. But extensions and modules are chargeable. Stable and secure. So once developed, very little maintenance required. A degree of technical expertise required. o Fast and agile. Flexible yet robust. As we can see, every CMS platform has its unique strengths and will perform exceptionally well for certain specific application types. So, in addition to the points above, make sure that you take into account your end goals for the website you are building, its required functional capabilities, and your overall budget and resources. At GMI, we have been at the forefront of the global digital revolution for the past 16 years. Our expert web design and development teams are passionate about exploiting the remarkable capabilities of modern CMS platforms to serve our clients’ unique business needs. If you are a business leader, an entrepreneur or an enthusiast looking to build or improve your digital real estate, we can not only help you choose the best CMS platform for your requirements, but also help develop a robust, interactive, attractive and business-oriented website to achieve your goals. So, get in touch with us today.